According to behavioural scientist and lecturer, Patrick Fagan, "regularly experiencing live music is the key to building a long-standing improvement to wellbeing." Costa del Sol has a variety of live music and entertainment options available for everyone, no matter what your music preferences are. Keep on reading to find out where the best Costa del Sol concert venues are. Close to the sea and Marbella Harbour, many tourists often flock to this lively part of Costa del Sol - and it is easy to see why! Live music in Marbella has everything you could possibly need, from the infamous flamenco show in Marbella to open-air auditoriums, you'll be spoilt for choice. Combining music venue and brewery, the La Catarina is great for music lovers who want to treat themselves to some excellent craft beers and live concerts or jam sessions. La Catarina Brewery and Music Venue is situated eight miles away from the centre of Marbella, at Puerto Banús Marina. But it is definitely worth the trip because many customers who go are not let down. Who doesn't want to enjoy their evening outside at a beautiful open-air amphitheatre, in Marbella’s Parque de la Constitución? During the summer season, this elegant venue boasts a wide variety of Sol live music and Sol concert performances. From jazz to blues, and flamenco to plays, this concert venue has it all! There is even a cafe in the park, where you can get alcoholic and non-alcoholic refreshments. Experience the city's most well-known peña (that means "club" to those who don't speak Spanish): the Ana Maria Flamenco Bar. Filled with intense performances that entertain, this exciting bar promises to give you an evening you'll never forget. You can find the bar in the Old Town, entry costs €25 and drinks start from €10 - so take some extra cash if you want a heavy night. For music that lasts the entire night, like until 6 am, music and party lovers need to go to Buddha Music Bar. The bar is often playing live Latin music, but it also has special calendar events throughout the year such as exotic dancers and firework shows. If you don't want to party the whole night away, Buddha Music Bar also specialises in Japanese food - which many thoroughly enjoy according to reviews. La Sala is situated in Puerto Banús, five miles of Marbella city centre, and offers live music every night. This up-market bar is ideal for those who want top quality live music seven nights a week. La Sala also has a Live Lounge which features a variety of events throughout the year. If you need any more convincing about this gem, they also offer delicious Sunday roasts and all day live music on Sundays. Remember to watch out for big names in music in Marbella too, such as Simon Cowell, who lives close by! 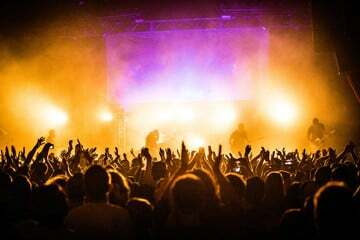 Make sure you catch some live music at one of these Costa del Sol concert venues during your stay - after all, it might improve your wellbeing and help you live longer! Contact us now if you are looking to buy, sell, or rent a property in Costa del Sol.